In some ways, smell is the most mysterious and powerful of the human senses. A single whiff of scent can whisk you back to a moment in the distant past, to a memory as vivid and real as the current time. 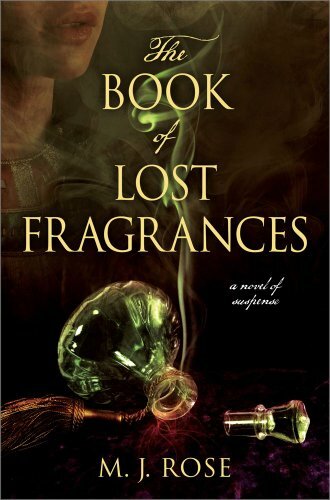 But those memories aren’t always pleasant—and in the world of this book, the memories raised by a scent could resurrect far more than you expect. Jac L’Etoile and her brother Robbie are the heirs to the House of L’Etoile, a fabled French perfume company now on the verge of bankruptcy. Robbie has a plan to save the company, but it’s based on a family legend. He wants to recover the recipe for a legendary perfume said to have been blended millennia ago for Cleopatra herself. A perfume created to reveal the memory of one’s previous lives. If there’s one thing Jac knows, it’s the power of legends and how belief in them can destroy your life. As the writer and host of a popular cable show called “Mythfinders,” Jac has done her best to cover her own personal pain—her mother’s suicide, her father’s slide into dementia, her own abandonment by Griffin North, the only man she ever loved—behind the calm, even façade of researcher and explainer. She makes a living revealing the truth behind classic legends. The last thing she wants is to join her brother in a wild goose chase for something that couldn’t possibly have existed in the first place. But Robbie isn’t the only one searching for the lost scent. Jungian therapist and reincarnationist Dr. Malachi Samuels will pay a fortune for the mythical perfume that unlocks memories of past lives. The Chinese government is desperate to get it before Tibetan rebels can use it to raise support for Buddhist monks and Tibetan freedom. When Robbie goes missing, Jac is forced to partner with her former lover Griffin to find him. Traveling from New York City, to the streets of Paris, to the catacombs beneath the ancient city, and back in time to former lives and loves, Jac knows that discovering the truth behind this legend is a matter of life and death. M. J. Rose’s multi-stranded plot skillfully hits all the right buttons, blending exotic settings, romance, and paranormal fantasy with political intrigue into a colorful story that would be right at home as a Hollywood thriller.